This is a fun and creative game that will end up in lots of laughters. I am sure your bride-to-be and guests will throroughly enjoy playing this game. How to Play 1: Take one print out of any of the three colors given below. Now ask each of the guest to write a line about how they think bride and groom met and pass it to the next guest. Each of the guest can add a funny, silly, naughty or realistic comment about how they think both of them has met. At the end read the story aloud. How to Play 2: Follow the same way as mentioned above but ask the guests to fold the paper after adding the line so the next guest can not see what previous guests have written. At the end read out the story aloud. How to Play 3: Write 10 wedding related words such as : wedding, bride, flowers etc. and 10 non wedding related words like hammer, bag, tree etc. and take print outs of this game according to the number of party guests and distribute these among them along with a pen or pencil. Ask the guests to create a love story using all the 20 words within 7-8 minutes and then each guest will read their story. This will crack up everyone. Bride-to-be will choose the winner. This is free printable for 'Write a love story' game in lilac color. Print this game stationery if it matches your bridal shower party theme more. Just click on the image shared above and then right click and save the bigger image to your computer. This is my most favorite color printable for this game. 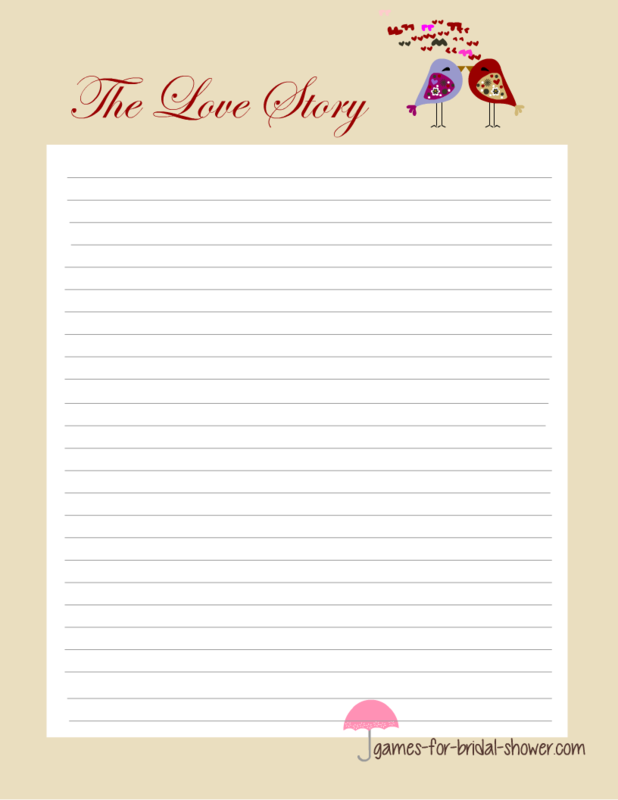 Two adorable birds make this a perfect writing paper to write the love story of bride and groom. If pink color matches your Bridal Shower Party theme more then use these free printable stationery for this game with a pink border. Your guests will love the way you will present your games.